Size: Please see kits below. 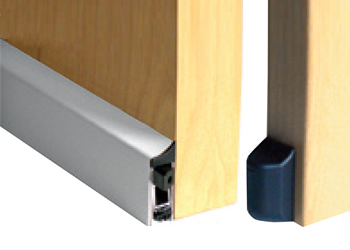 Designed to add mass to internal lightweight doors to improve their acoustic performance and incorporating easy to fit acoustic seals for the frame and threshold. The kit comprises 5 x 1m lengths of triangular, self-adhesive batwing seals for the sides and top of the frame along with a 930mm drop down seal for the threshold that can easily be shortened by up to 100mm using a hacksaw. One sheet of sound barrier mat and a can of aerosol adhesive to fix it and ful,l easy to follow instructions. This kit is designed to uprate the soundproofing of lightweight internal doors that allow excessive noise leakage through the door and beneath the threshold and around the frame. Once the kit is fitted the soundproofing of the door will be improved up to around 30dB. If your looking for any alternative type of acoustic seal please contact us because we are able to supply alternatives.